Note to reader: all charts represent segments of response data, the rest of which can be found in the upcoming report. The executives in charge of data practices within financial institutions are responsible for driving a wide range of initiatives, from according with compliance requirements to integrating the means to gain insights from machine learning and AI. Aside from the obligations that the data practice has to meet their reporting requirements, leaders in the space are also being called upon to drive digital transformations in how data is collected and processed. This leaves them in a position where they must actively think about the security of their data, as well as the solutions that they are sourcing to give them better visibility and control of that data. Between a desire to gain greater visibility through transitions to the cloud and the adoption of new solutions, questions about security are also coming to the fore. In order to better understand what executives in data management are thinking about risk and what steps they are taking to safeguard their data from it, FIMA conducted a survey in Q2 2018 to benchmark the progress of the community. Let's look at three trends taken from the data. Data security and financial crime is a significant focus within 67% of data practices. With the advent of new data privacy rules, regulatory burdens, and M&A activity; and following headlines on major data breaches over the past several years; more than half of respondents are focusing on the challenges posed by data security. 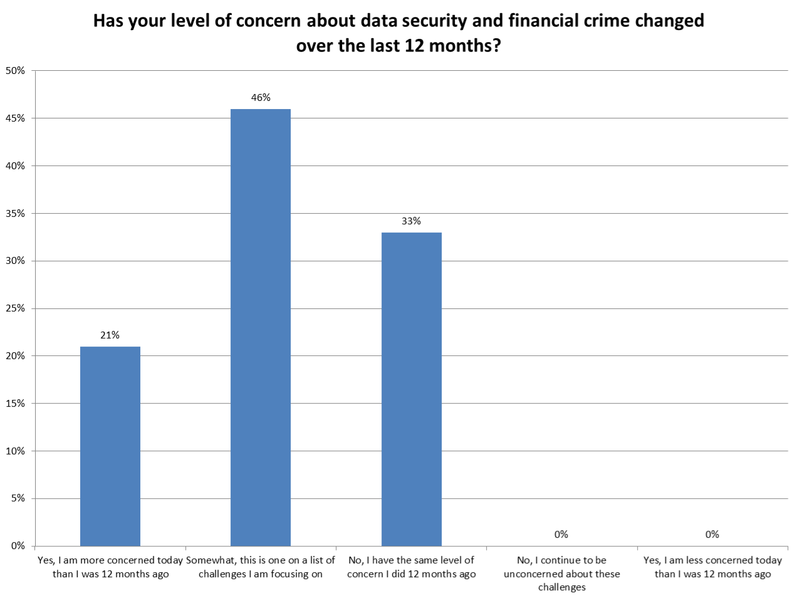 In fact, 21% of respondents say that their levels of concern have increased since 12 months ago. Cybersecurity, data governance, and regulation are the three most concerning risk factors that data executives are facing. Cybersecurity is an area that is demanding more and more attention from leaders in the data practice. 90% of respondents are at the very least moderately concerned about their cybersecurity. What's remarkable is that from a pool of executives working within the data practice, more emphatic concern is placed on cybersecurity than data governance risk. 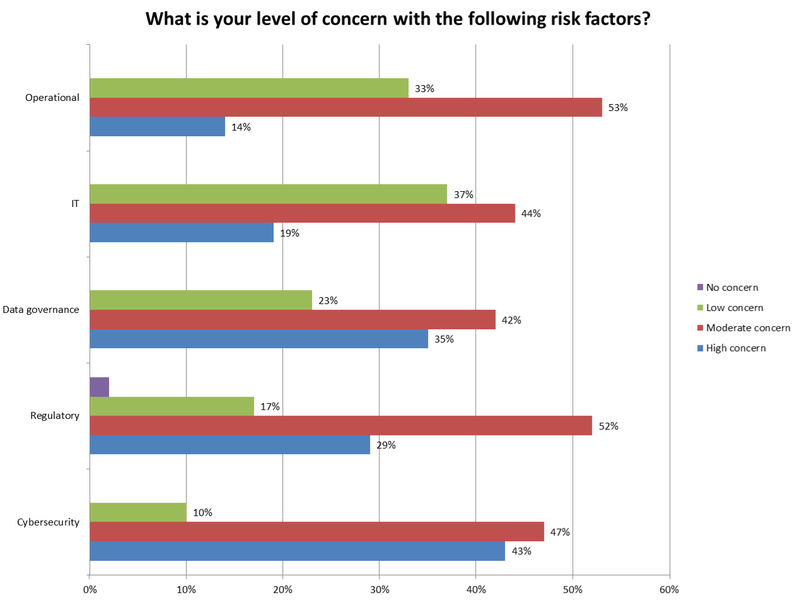 Operational risk and IT risk are areas where respondents do not generally have as high a level of concern. That said, without the right solutions and processes in place, both of these areas can represent significant vulnerabilities without a strategic approach taken to risk mitigation. 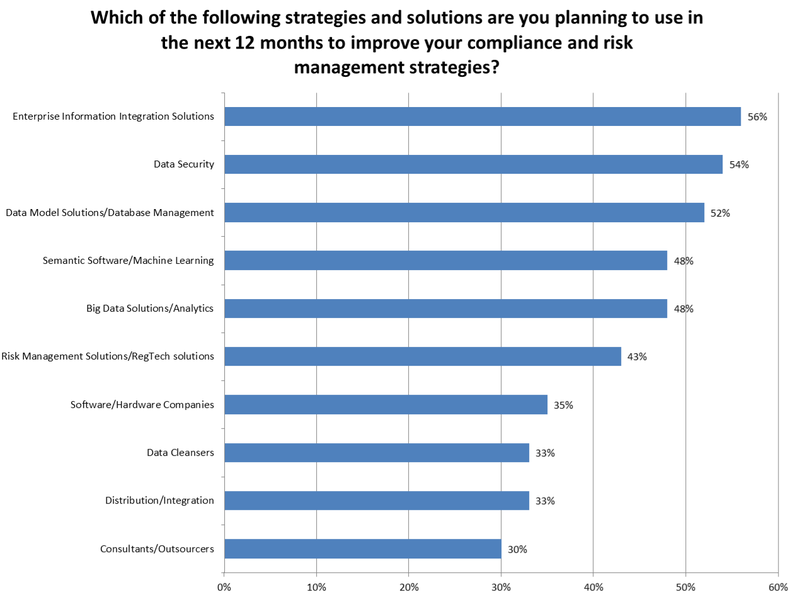 The top-three solutions being looked at for integration within the next 12 months are enterprise information integration solutions, data security tools, and data model and database management solutions. Building a better approach to compliance and risk often starts with identifying the solutions that can support more developed and comprehensive strategies. Over half of respondents are planning on seeking-out enterprise information integration solutions, which are focused on bringing the information available across the organization into a single, all-encompassing viewpoint. Data security solutions are being looked at to allay the security concerns highlighted in today's data practices. Specifically, the introduction of more and more cloud technology, as well as tools to centralize data and introduce automation create the means for both significant advantage as well as significant risks that must be addressed. Questions for the future of data security. Some of the key questions facing the executives responsible for their data practices are focused on the implications of security concerns to the pace of their strategic transformations. Financial institutions face pressure to outcompete their peers in their adoptions of technology as well as their user experiences. In order to win, their ability to simultaneously utilize, respect, and protect their customers' data is paramount.